This article is about the historic Liberal Party. For the party formed by the 1988 merger with the SDP, see Liberal Democrats. For the Liberal Party formed by those opposed to the 1988 merger, see Liberal Party (UK, 1989). The Liberal Party was a liberal political party which was one of the two major parties in the United Kingdom in the 19th and early 20th century. The party arose from an alliance of Whigs and free-trade Peelites and Radicals in the 1850s. By the end of the nineteenth century, it had formed four governments under William Gladstone. Despite splitting over the issue of Irish Home Rule, the party returned to power in 1906 with a landslide victory and introduced the welfare reforms that created a basic British welfare state. H. H. Asquith was Liberal Prime Minister between 1908 and 1916, followed by David Lloyd George whose premiership lasted until 1922 when the coalition the party had formed with the Conservative Party in World War I came to an end. By the end of the 1920s, the Labour Party had replaced the Liberals as the Tories' main rival. The party went into decline and by the 1950s won no more than six seats at general elections. Apart from notable by-election victories, the party's fortunes did not improve significantly until it formed the SDP–Liberal Alliance with the newly formed Social Democratic Party (SDP) in 1981. At the 1983 General Election, the Alliance won over a quarter of the vote, but only 23 of the 650 seats it contested. At the 1987 General Election, its vote fell below 23% and the Liberal and Social Democratic parties merged in 1988 to form the Liberal Democrats. A small Liberal Party was formed in 1989 by party members opposed to the merger. A crowd waits outside Leeds Town Hall to see them elect a Liberal Party candidate during the 1880 general elections. If there be any party which is more pledged than another to resist a policy of restrictive legislation, having for its object social coercion, that party is the Liberal party. (Cheers.) But liberty does not consist in making others do what you think right, (Hear, hear.) The difference between a free Government and a Government which is not free is principally this—that a Government which is not free interferes with everything it can, and a free Government interferes with nothing except what it must. A despotic Government tries to make everybody do what it wishes; a Liberal Government tries, as far as the safety of society will permit, to allow everybody to do as he wishes. It has been the tradition of the Liberal party consistently to maintain the doctrine of individual liberty. It is because they have done so that England is the place where people can do more what they please than in any other country in the world...It is this practice of allowing one set of people to dictate to another set of people what they shall do, what they shall think, what they shall drink, when they shall go to bed, what they shall buy, and where they shall buy it, what wages they shall get and how they shall spend them, against which the Liberal party have always protested. By the early 20th century the Liberals stance began to shift towards "New Liberalism", what would today be called social liberalism: a belief in personal liberty with a support for government intervention to provide minimum levels of welfare. This shift was best exemplified by the Liberal government of H. H. Asquith and his Chancellor David Lloyd George, whose Liberal reforms in the early 1900s created a basic welfare state. After nearly becoming extinct in the 1940s and 50s, the Liberal Party revived its fortunes somewhat under the leadership of Jo Grimond in the 1960s, by positioning itself as a radical centrist non-socialist alternative to the Conservative and Labour Party governments of the time. The Liberal Party grew out of the Whigs, who had their origins in an aristocratic faction in the reign of Charles II, and the early 19th century Radicals. The Whigs were in favour of reducing the power of the Crown and increasing the power of Parliament. Although their motives in this were originally to gain more power for themselves, the more idealistic Whigs gradually came to support an expansion of democracy for its own sake. The great figures of reformist Whiggery were Charles James Fox (died 1806) and his disciple and successor Earl Grey. After decades in opposition, the Whigs returned to power under Grey in 1830 and carried the First Reform Act in 1832. As early as 1839 Russell had adopted the name of "Liberals", but in reality his party was a loose coalition of Whigs in the House of Lords and Radicals in the Commons. 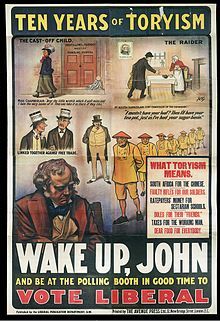 The leading Radicals were John Bright and Richard Cobden, who represented the manufacturing towns which had gained representation under the Reform Act. They favoured social reform, personal liberty, reducing the powers of the Crown and the Church of England (many of them were Nonconformists), avoidance of war and foreign alliances (which were bad for business), and above all free trade. For a century, free trade remained the one cause which could unite all Liberals. In 1841 the Liberals lost office to the Conservatives under Sir Robert Peel, but their period in opposition was short, because the Conservatives split over the repeal of the Corn Laws, a free trade issue, and a faction known as the Peelites (but not Peel himself, who died soon after) defected to the Liberal side. This allowed ministries led by Russell, Palmerston, and the Peelite Lord Aberdeen to hold office for most of the 1850s and 1860s. 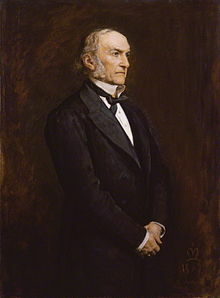 A leading Peelite was William Ewart Gladstone, who was a reforming Chancellor of the Exchequer in most of these governments. 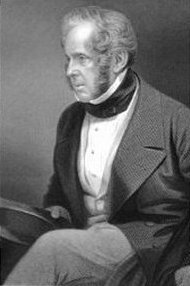 The formal foundation of the Liberal Party is traditionally traced to 1859 and the formation of Palmerston's second government. The Whig-Radical amalgam could not become a true modern political party, however, while it was dominated by aristocrats, and it was not until the departure of the "Two Terrible Old Men", Russell and Palmerston, that Gladstone could become the first leader of the modern Liberal Party. This was brought about by Palmerston's death in 1865 and Russell's retirement in 1868. After a brief Conservative government (during which the Second Reform Act was passed by agreement between the parties) Gladstone won a huge victory at the 1868 election and formed the first Liberal government. The establishment of the party as a national membership organisation came with the foundation of the National Liberal Federation in 1877. John Stuart Mill was a Liberal MP from 1865 to 1868. For the next thirty years Gladstone and Liberalism were synonymous. William Ewart Gladstone served as prime minister four times (1868–74, 1880–85, 1886, and 1892–94). His financial policies, based on the notion of balanced budgets, low taxes, and laissez-faire, were suited to a developing capitalist society, but they could not respond effectively as economic and social conditions changed. Called the "Grand Old Man" later in life, Gladstone was always a dynamic popular orator who appealed strongly to the working class and to the lower middle class. Deeply religious, Gladstone brought a new moral tone to politics, with his evangelical sensibility and his opposition to aristocracy. His moralism often angered his upper-class opponents (including Queen Victoria), and his heavy-handed control split the Liberal Party. As prime minister 1868 to 1874, Gladstone headed a Liberal Party which was a coalition of Peelites like himself, Whigs, and Radicals; he was now a spokesman for "peace, economy and reform." One major achievement was the Elementary Education Act of 1870, which provided England with an adequate system of elementary schools for the first time. He also secured the abolition of the purchase of commissions in the army and of religious tests for admission to Oxford and Cambridge; the introduction of the secret ballot in elections; the legalization of trade unions; and the reorganization of the judiciary in the Judicature Act. In the 1874 general election Gladstone was defeated by the Conservatives under Disraeli during a sharp economic recession. He formally resigned as Liberal leader and was succeeded by the Marquess of Hartington, but he soon changed his mind and returned to active politics. He strongly disagreed with Disraeli's pro-Ottoman foreign policy and in 1880 he conducted the first outdoor mass-election campaign in Britain, known as the Midlothian campaign. The Liberals won a large majority in the 1880 election. Hartington ceded his place and Gladstone resumed office. Among the consequences of the Third Reform Act (1884–85) was the giving of the vote to the Catholic peasants in Ireland, and the consequent creation of an Irish Parliamentary Party led by Charles Stewart Parnell. In the 1885 general election this party won the balance of power in the House of Commons, and demanded Irish Home Rule as the price of support for a continued Gladstone ministry. Gladstone personally supported Home Rule, but a strong Liberal Unionist faction led by Joseph Chamberlain, along with the last of the Whigs, Hartington, opposed it. The Irish Home Rule bill gave all owners of Irish land a chance to sell to the state at a price equal to 20 years' purchase of the rents and allowing tenants to purchase the land. Irish nationalist reaction was mixed, Unionist opinion was hostile, and the election addresses during the 1886 election revealed English radicals to be against the bill also. Among the Liberal rank and file, several Gladstonian candidates disowned the bill, reflecting fears at the constituency level that the interests of the working people were being sacrificed to finance a rescue operation for the landed elite. The result was a catastrophic split in the Liberal Party, and heavy defeat in the 1886 election at the hands of Lord Salisbury. There was a final weak Gladstone ministry in 1892, but it also was dependent on Irish support and failed to get Irish Home Rule through the House of Lords. Gladstone finally retired in 1894, and his ineffectual successor, Lord Rosebery, led the party to another heavy defeat in the 1895 general election. The Liberals languished in opposition for a decade, while the coalition of Salisbury and Chamberlain held power. The 1890s were marred by infighting between the three principal successors to Gladstone, party leader William Harcourt, former Prime Minister Lord Rosebery, and Gladstone's personal secretary, John Morley. This intrigue finally led Harcourt and Morley to resign their positions in 1898 as they continued to be at loggerheads with Rosebery over Irish home rule and issues relating to imperialism. Replacing Harcourt as party leader was Sir Henry Campbell-Bannerman. Harcourt's resignation briefly muted the turmoil in the party, but the beginning of the Second Boer War soon nearly broke the party apart, with Rosebery and a circle of supporters including important future Liberal leaders H.H. Asquith, Edward Grey, and Richard Burdon Haldane forming a clique dubbed the "Liberal Imperialists" that supported the government in the prosecution of the war. On the other side, more radical members of the party formed a Pro-Boer faction that denounced the conflict and called for an immediate end to hostilities. Quickly rising to prominence among the Pro-Boers was David Lloyd George, a relatively new MP and a master of rhetoric, who took advantage of having a national stage to speak out on a controversial issue to make his name in the party. Harcourt and Morley also sided with this group, though with slightly different aims. Campbell-Bannerman tried to keep these forces together at the head of a moderate Liberal rump, but in 1901 he delivered a speech on the government's "methods of barbarism" in South Africa that pulled him further to the left and nearly tore the party in two. The party was saved after Salisbury's retirement in 1902 when his successor, Arthur Balfour, pushed a series of unpopular initiatives such as a new education bill and Joseph Chamberlain called for a new system of protectionist tariffs. Campbell-Bannerman was able to rally the party around the traditional liberal platform of free trade and land reform and led them to the greatest election victory in their history. This would prove the last time the Liberals won a majority in their own right. 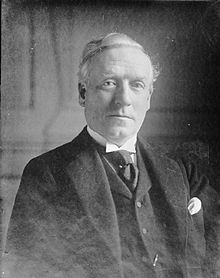 Although he presided over a large majority, Sir Henry Campbell-Bannerman was overshadowed by his ministers, most notably H. H. Asquith at the Exchequer, Edward Grey at the Foreign Office, Richard Burdon Haldane at the War Office and David Lloyd George at the Board of Trade. An ill Campbell-Bannerman retired in 1908 and died later that year. He was succeeded by Asquith, who stepped up the government's radicalism. Lloyd George succeeded Asquith at the Exchequer, and was in turn succeeded at the Board of Trade by Winston Churchill, a recent defector from the Conservatives. The General Election of 1906 also represented a shift to the Left by the Liberal Party. According to Rosemary Rees, almost half of the Liberal MPs elected in 1906 were supportive of the 'New Liberalism' (which advocated government action to improve people's lives),) while claims were made that “five-sixths of the Liberal party are left wing.” Other historians, however, have questioned the extent to which the Liberal Party experienced a leftward shift; according to Robert C. Self however, only between 50 and 60 Liberal MPs out of the 400 in the parliamentary party after 1906 were Social Radicals, with a core of 20 to 30. Nevertheless, important junior offices were held in the cabinet by what Duncan Tanner has termed "genuine New Liberals, Centrist reformers, and Fabian collectivists," and much legislation was pushed through by the Liberals in government. This included the regulation of working hours, National Insurance and welfare. It was at this time that a political battle over the so-called People's Budget resulted in the passage of an act ending the power of the House of Lords to block legislation. The cost was high, however, as the government was required by the king to call two general elections in 1910 to validate its position and ended up frittering away most of its large majority, being left once again dependent on the Irish Nationalists. As a result, Asquith was forced to introduce a new third Home Rule bill in 1912. Since the House of Lords no longer had the power to block the bill, the Unionist's Ulster Volunteers led by Sir Edward Carson, launched a campaign of opposition that included the threat of armed resistance in Ulster and the threat of mass resignation of their commissions by army officers in Ireland in 1914 (see Curragh Incident). In their resistance to Home Rule the Ulster Protestants had the full support of the Conservatives, whose leader, Andrew Bonar Law, was of Ulster-Scots descent. The country seemed to be on the brink of civil war when the First World War broke out in August 1914. Historian George Dangerfield has argued that the multiplicity of crises in 1910 to 1914, before the war broke out, so weakened the Liberal coalition that it marked the Strange Death of Liberal England. However, most historians date the collapse to the crisis of the First World War. The war struck at the heart of everything British Liberals believed in. The party divided over the distinctly illiberal policies that were introduced under its auspices, including conscription and the Defence of the Realm Act. Several Cabinet ministers resigned, and Asquith, the master of domestic politics, proved a poor war leader. Lloyd George and Churchill, however, were zealous supporters of the war, and gradually forced the old peace-orientated Liberals out. The poor British performance in the early months of the war forced Asquith to invite the Conservatives into a coalition (on 17 May 1915). This marked the end of the last all-Liberal government. This coalition fell apart at the end of 1916, when the Conservatives withdrew their support from Asquith and gave it instead to Lloyd George, who became Prime Minister at the head of a coalition government largely made up of Conservatives. Asquith and his followers moved to the opposition benches in Parliament and the Liberal Party was split once again. Wilson argues that Lloyd George abandoned many liberal principles in his single-minded crusade to win the war at all costs. That brought him and like-minded Liberals into a coalition with the Conservatives, largely on the ground long occupied by Conservatives: they were not oriented toward world peace or liberal treatment of Germany, nor discomfited by aggressive and authoritarian measures of state power. More deadly to the future of the Party, says Wilson, was its repudiation by ideological Liberals, who decided sadly that it no longer represented their principles. Finally the presence of the vigorous new Labour Party on the left gave a new home to voters disenchanted with the Liberal Party. In the 1918 general election Lloyd George, "the Man Who Won the War", led his coalition into another khaki election, and won a sweeping victory over the Asquithian Liberals and the newly emerging Labour Party. Lloyd George and the Conservative leader Andrew Bonar Law wrote a joint letter of support to candidates to indicate they were considered the official Coalition candidates – this "coupon", as it became known, was issued against many sitting Liberal MPs, often to devastating effect, though not against Asquith himself. Asquith and most of his colleagues lost their seats. Lloyd George still claimed to be leading a Liberal government, but he was increasingly under the influence of the rejuvenated Conservative party. In 1922 the Conservative backbenchers rebelled against the continuation of the coalition, citing in particular the Chanak Crisis over Turkey and Lloyd George's corrupt sale of honours, amongst other grievances, and Lloyd George was forced to resign. The Conservatives came back to power under Bonar Law and then Stanley Baldwin. At the 1922 and 1923 elections the Liberals won barely a third of the vote and only a quarter of the seats in the House of Commons, as many radical voters abandoned the divided Liberals and went over to Labour. In 1922 Labour became the official opposition. A reunion of the two warring factions took place in 1923 when the new Conservative Prime Minister Stanley Baldwin committed his party to protective tariffs, causing the Liberals to reunite in support of free trade. The party gained ground in the 1923 general election but ominously made most of its gains from Conservatives whilst losing ground to Labour – a sign of the party's direction for many years to come. The party remained the third largest in the House of Commons, but the Conservatives had lost their majority. There was much speculation and fear about the prospect of a Labour government, and comparatively little about a Liberal government, even though it could have plausibly presented an experienced team of ministers compared to Labour's almost complete lack of experience, as well as offering a middle ground that could obtain support from both Conservatives and Labour in crucial Commons divisions. But instead of trying to force the opportunity to form a Liberal government, Asquith decided instead to allow Labour the chance of office, in the belief that they would prove incompetent and this would set the stage for a revival of Liberal fortunes at Labour's expense. It was a fatal error. 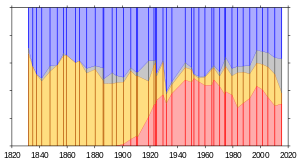 Share of the vote received by Conservatives (blue), Whigs/Liberals/Liberal Democrats (orange), Labour (red) and others (grey) in general elections since 1832. Following success as the successor to the Whig party, the party's share of the popular vote plummeted after the First World War as it lost votes to the new Labour party and fractured into groups such as the National and Coalition Liberals. Asquith died in 1928 and the enigmatic figure of Lloyd George returned to the leadership and began a drive to produce coherent policies on many key issues of the day. In the 1929 general election he made a final bid to return the Liberals to the political mainstream, with an ambitious programme of state stimulation of the economy called We Can Conquer Unemployment!, largely written for him by the Liberal economist John Maynard Keynes. The Liberals gained ground, but once again it was at the Conservatives' expense whilst also losing seats to Labour. Indeed, the urban areas of the country suffering heavily from unemployment, which might have been expected to respond the most to the radical economic policies of the Liberals, instead gave the party its worst results. By contrast most of the party's seats were won either due to the absence of a candidate from one of the other parties or in rural areas on the "Celtic fringe", where local evidence suggests that economic ideas were at best peripheral to the electorate's concerns. The Liberals now found themselves with 59 members, holding the balance of power in a Parliament where Labour was the largest party but lacked an overall majority. Lloyd George offered a degree of support to the Labour government in the hope of winning concessions, including a degree of electoral reform to introduce the alternative vote, but this support was to prove bitterly divisive as the Liberals increasingly divided between those seeking to gain what Liberal goals they could achieve, those who preferred a Conservative government to a Labour one and vice versa. In 1931 MacDonald's government fell apart under the Great Depression, and the Liberals agreed to join his National Government, dominated by the Conservatives. Lloyd George himself was ill and did not actually join. Soon, however, the Liberals faced another divisive crisis when a National Government was proposed to fight the 1931 general election with a mandate for tariffs. 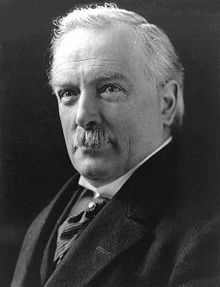 From the outside, Lloyd George called for the party to abandon the government completely in defence of free trade, but only a few MPs and candidates followed. Another group under Sir John Simon then emerged, who were prepared to continue their support for the government and take the Liberal places in the Cabinet if there were resignations. The third group under Sir Herbert Samuel pressed for the parties in government to fight the election on separate platforms. In doing so the bulk of Liberals remained supporting the government, but two distinct Liberal groups had emerged within this bulk – the Liberal Nationals (officially the "National Liberals" after 1947) led by Simon, also known as "Simonites", and the "Samuelites" or "official Liberals", led by Samuel who remained as the official party. Both groups secured about 34 MPs but proceeded to diverge even further after the election, with the Liberal Nationals remaining supporters of the government throughout its life. There were to be a succession of discussions about them rejoining the Liberals, but these usually foundered on the issues of free trade and continued support for the National Government. The one significant reunification came in 1946 when the Liberal and Liberal National party organisations in London merged. The official Liberals found themselves a tiny minority within a government committed to protectionism. Slowly they found this issue to be one they could not support. In early 1932 it was agreed to suspend the principle of collective responsibility to allow the Liberals to oppose the introduction of tariffs. Later in 1932 the Liberals resigned their ministerial posts over the introduction of the Ottawa Agreement on Imperial Preference. However, they remained sitting on the government benches supporting it in Parliament, though in the country local Liberal activists bitterly opposed the government. Finally in late 1933 the Liberals crossed the floor of the House of Commons and went into complete opposition. By this point their number of MPs was severely depleted. In the 1935 general election, just 17 Liberal MPs were elected, along with Lloyd George and three followers as "independent Liberals". Immediately after the election the two groups reunited, though Lloyd George declined to play much of a formal role in his old party. Over the next ten years there would be further defections as MPs deserted to either the Liberal Nationals or Labour. Yet there were a few recruits, such as Clement Davies, who had deserted to the National Liberals in 1931 but now returned to the party during the Second World War and who would lead it after the war. In 1940 they joined Churchill's wartime coalition government, with Sinclair serving as Secretary of State for Air, the last British Liberal to hold Cabinet rank office for seventy years. However, it was a sign of the party's lack of importance that they were not included in the War Cabinet; some leading party members founded Radical Action, a group which called for liberal candidates to break the war-time electoral pact. At the 1945 general election, Sinclair and many of his colleagues lost their seats to both Conservatives and Labour, and the party returned just 12 MPs to Westminster. But this was just the beginning of the decline. In 1950, the general election saw the Liberals return just nine MPs. Another general election was called in 1951, and the Liberals were left with just six MPs; all but one of them were aided by the fact that the Conservatives refrained from fielding candidates in those constituencies. In 1957 this total fell to five when one of the Liberal MPs died and the subsequent by-election was lost to the Labour Party, which selected the former Liberal Deputy Leader Lady Megan Lloyd George as its own candidate. The Liberal Party seemed close to extinction. During this low period, it was often joked that Liberal MPs could hold meetings in the back of one taxi. The new middle-class suburban generation began to find the Liberals' policies attractive again. Under Grimond (who retired in 1967) and his successor, Jeremy Thorpe, the Liberals regained the status of a serious third force in British politics, polling up to 20% of the vote but unable to break the duopoly of Labour and Conservative and win more than fourteen seats in the Commons. An additional problem was competition in the Liberal heartlands in Scotland and Wales from the Scottish National Party and Plaid Cymru who both grew as electoral forces from the 1960s onwards. Although Emlyn Hooson held on to the seat of Montgomeryshire, upon Clement Davies death in 1962, the party lost five Welsh seats between 1950 and 1966. In September 1966 the Welsh Liberal Party formed their own state party, moving the Liberal Party into a fully federal structure. Thorpe was subsequently forced to resign after allegations about his private life. The party's new leader, David Steel, negotiated the Lib-Lab pact with Wilson's successor as Prime Minister, James Callaghan. According to this pact, the Liberals would support the government in crucial votes in exchange for some influence over policy. The agreement lasted from 1977 to 1978, but proved mostly fruitless, for two reasons: the Liberals' key demand of proportional representation was rejected by most Labour MPs, whilst the contacts between Liberal spokespersons and Labour ministers often proved detrimental, such as between finance spokesperson John Pardoe and Chancellor of the Exchequer Denis Healey, who were mutually antagonistic. In 1981, defectors from a moderate faction of the Labour Party, led by former Cabinet ministers Roy Jenkins, David Owen and Shirley Williams, founded the Social Democratic Party (SDP). The new party and the Liberals quickly formed the SDP-Liberal Alliance, which for a while polled as high as 50% in the opinion polls and appeared capable of winning the next general election. Indeed, Steel was so confident of an Alliance victory that he told the 1981 Liberal conference, "Go back to your constituencies, and prepare for government!" In March 1988 the Liberal Party and Social Democratic Party merged to create the Social and Liberal Democrats, renamed the Liberal Democrats in October 1989. Over two-thirds of the members, and all the serving MPs, of the Liberal Party joined this party, led first jointly by Steel and the SDP leader Robert Maclennan. ^ Thomas Banchoff; Mitchell Smith (1999). Legitimacy and the European Union: The Contested Polity. Routledge. p. 123. ISBN 978-0-415-18188-4. Retrieved 16 July 2013. ^ "Education Scotland – Higher Bitesize Revision – History – Liberal – Impact: Revision 1". BBC. Retrieved 2010-04-25. ^ "1964 Liberal Party Election Manifesto". Liberal / SDP / Libdem Manifestos. Retrieved 2010-04-25. ^ Pearce, Robert and Stearn, Roger (2000). Access to History, Government and Reform: Britain 1815–1918 (Second Edition), page 56–7. Hodder & Stoughton. ^ Pearce, Robert and Stearn, Roger (2000). Access to History, Government and Reform: Britain 1815–1918 (Second Edition), page 74. Hodder & Stoughton. ^ "1945: Labour landslide buries Churchill". The election battles 1945–1997 (BBC News). ^ "1950: Labour limps home". The election battles 1945–1997 (BBC News). ^ "1951: Churchill's return". The election battles 1945–1997 (BBC News). ^ Keith Laybourn and Christine F. Collette, eds. (2003). Modern Britain Since 1979: A Reader. I.B.Tauris. pp. 125–128. ^ Peter Barberis; et al. (2000). Encyclopedia of British and Irish Political Organizations: Parties, Groups and Movements of the 20th Century. Continuum. pp. 301–3. Dutton, David. A History of the Liberal Party in the 20th Century, Palgrave Macmillan, 2004. ISBN 0-333-74656-2. This page was last modified on 16 January 2016, at 15:15.